The notion that success plays a part in media descriptions of tennis ace Andy Murray’s nationality has finally been dispelled by a postgraduate student at the University of Stirling. The commonly held view that Murray is British when he wins and Scottish when he loses has been dismissed by Ben Dickson in a recent research project. The dissertation study, which formed the final part of Dickson’s MSc in TESOL and Applied Linguistics, set out to examine the use of national identity in sports reporting and saw in the region of 200 press reports scrutinised. 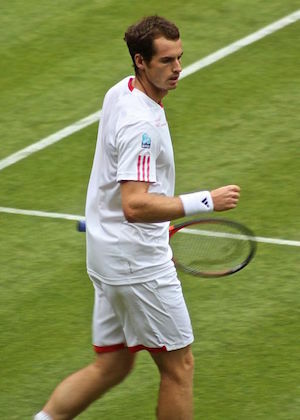 Analysing UK press reports on Murray’s Wimbledon matches from 2005 – 2014, Dickson found that, despite the result, patterns in the reporting of his national identity were consistent. Despite Murray’s losing or winning his match, all sections of the press remained consistent when describing his national identity. Dickson also discovered that reporting on Murray’s national identity depended more on the type of newspaper and where it was published. Scottish newspapers referred to Murray as Scottish twice as frequently as they referred to him as British. In the UK national press, broadsheets had an increased tendency to refer to Murray as Scottish while tabloids referred to him as British. Sampling both broadsheet and tabloid titles, the research threw up interesting results on the use of language. Analysis of key words showed that broadsheets tended to give a voice to Murray only when he was successful and that tabloids tended to use more personal language like first names and nicknames. Nationalistic terms were used to refer to Murray’s opponents in all newspapers except one broadsheet.